Recording artist Meek Mill during a game between the Philadelphia 76ers and the Atlanta Hawks at Wells Fargo Center. 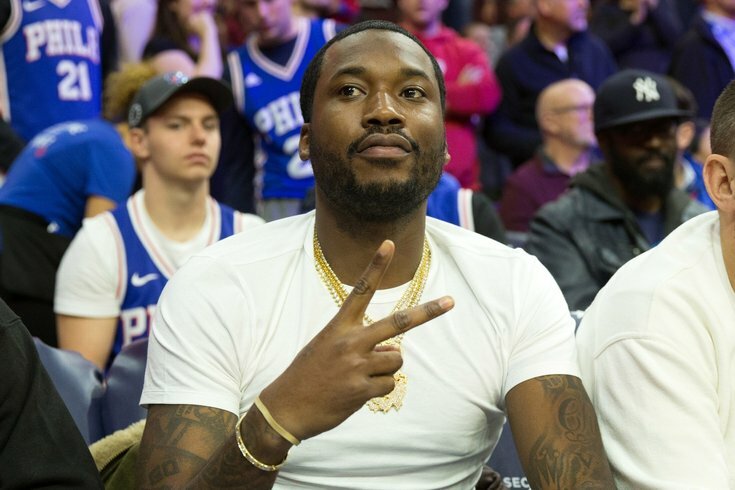 Just when it appeared momentum might shift in favor of Meek Mill, Philadelphia Judge Genice Brinkley has ruled the hip-hop must remain behind bars pending his appeal for post-conviction relief. The rapper was sentenced to two-to-four years in prison last November for violating the terms of his probation in a decade-old gun and drug case. His imprisonment sparked a wave of protests as public figures from Colin Kaepernick and Jay-Z to Julius Erving argued the case represents a miscarriage of justice. Did a teenager really get branded by a stranger at Reading Terminal Market? "This ruling from Judge Genece Brinkley simply reaffirms the fact she has turned Meek Mill’s case into a personal vendetta," said Joe Tacopina, the New York attorney representing Meek Mill, 30, whose real name is Robert Rihmeek Williams. Tacopina previously argued that Brinkley showed "enormous bias" in her sentencing of Williams, claiming the judge gave him unsolicited advice about who should manage him and even requested that the rapper use her name in one of his songs. The Philadelphia native was arrested twice while on probation, first for a fight at a St. Louis airport and later for reckless driving of a dirt bike in New York City. The charges were dropped in the airport case and Williams took a dismissal deal in the second case. Last month, Philadelphia District Attorney Larry Krasner said he would not oppose Meek Mill's release from jail pending the outcome of an appeal to the Pennsylvania Supreme Court. The D.A. 's office filed a motion in Common Pleas Court noting a high likelihood that Meek Mill's 2008 gun and drug conviction will be reversed. Prosecutors cited allegations that the rapper's arresting officer in the case, Reggie Graham, lied under oath during his trial. Meek Mill's attorneys also filed a pair of affidavits including testimony from two former police offers who questioned Graham's credibility. His name appeared on former D.A. Seth Williams' secretive list of current and former Philadelphia law enforcement officers who may have provided unreliable court testimony. Williams has since been convicted of corruption and sentenced to prison. Late last month, even Pennsylvania Governor Tom Wolf came out in support of Meek Mill's release. "In spite of the recommendations from the Philadelphia District Attorney’s office, which was supported by Governor Tom Wolf, the judge continues to stand alone in supporting Officer Reginald Graham’s perjured testimony as well as his criminal behavior that has been documented," Tacopina said. "Fortunately, we have already filed petitions with the Pennsylvania Supreme Court to secure his release, and we remain hopeful that the Court will right this injustice very soon."